Yale University Press, 2013. Recommended for more scholarly audiences. Click here for more information and for an excerpt from the introduction. Wadsworth Publishing Company, 2003. Recommended for general and scholarly audiences. How are we to live? What makes someone a good person, and how are we to figure out which way of life is to be preferred over others? These are the questions that concern Alasdair MacIntyre, one of the most important philosophical voices of the late twentieth century. With a sweeping knowledge of history and an eloquent style of writing, MacIntyre convinces his readers that morality is inseparable from cultural heritage, and that different ways of reasoning are in constant conflict. He describes a world in which rival moral systems struggle to survive and to overshadow their competitors, and one in which beliefs can only be defended by appealing to important texts, sacred scriptures, and lengthy histories..
Wadsworth Publishing Company, 2000. Recommended for general and scholarly audiences. Adam Smith is generally regarded as the father of modern capitalism; the first person to describe the process of the free market in a systematic way. But he is also a moral philosopher extraordinaire with a wide range of work that will challenge and intrigue people with diverse interests in philosophy, economics, political science, sociology, anthropology, and history. This introductory text assists readers in understanding Smith's philosophy so they can more fully engage in useful, intelligent class dialogue and improve their understanding of course content. 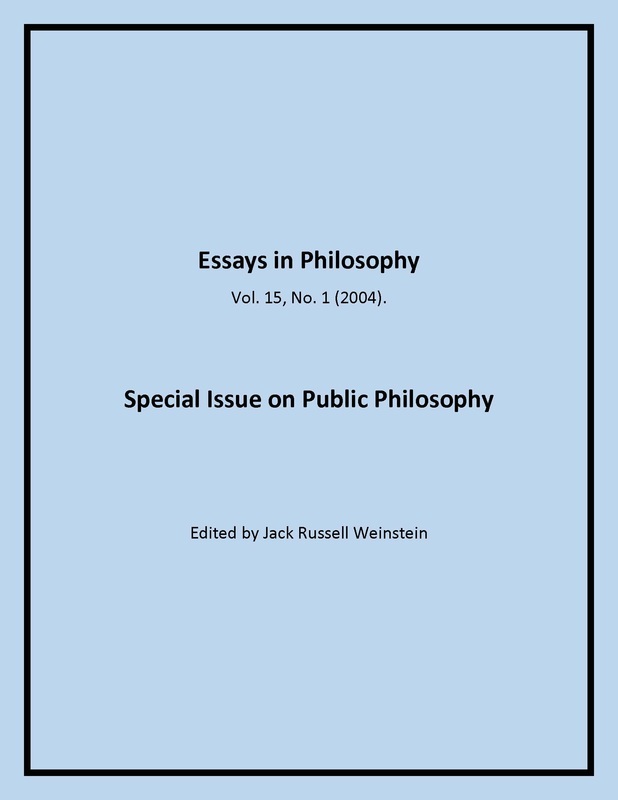 An academic journal issue focused on public philosophy in the university. Some articles tend to me more technical or professionalized, but others, including Jack Weinstein's, are suitable for a general audience. Click on the image to download the articles for free. A philosophy magazine intended for general audiences. Click on the image to download the issue for free. A scholarly journal containing a special symposium on Adam Smith and education edited by Jack Russell Weinstein. Recommended for more scholarly audiences. A scholarly journal issue dedicated to examining the role of critical thinking in political philosophy. Recommended for more scholarly audiences. Available only in select libraries. Proceedings of the first annual Junior Visiting Fellow's Conference at the Institut fuer die Wissenschaften vom Menschen, organized by Jack Russell Weinstein. Recommended for more scholarly audiences. Out of Print.